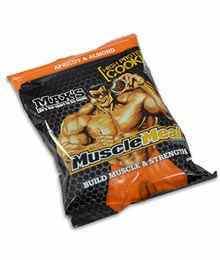 Max’s Muscle Meal Cookie, High Protein Cookie, is ideal to consume as a snack. Perfect for high-performance athletes or people who are below their healthy weight. They provide a high protein content of high biological value that is used for muscle recovery and protein synthesis. These proteins are concentrated and purified through a microfiltration process and are composed of proteins from the whey and soy. These cookies also contain carbohydrate of easy absorption and high glycemic index in order to ensure adequate energy supply, so protein can fulfil their plastic function and are not used for getting energy when metabolism is increased. Thus, glycogen stores can be replenished in less amount of time after exercise. Cookies Max’s Muscle Meal High Protein contains essential fatty acids, branched chain amino acids and glutamine that favour not only muscle repair, but also strengthen the immune system and the functioning of intestinal cells. Thanks to its composition, Max’s cookies are ideal to complement any diet high in calories and protein. Each serving of cookies provides 24 grams of protein of the highest quality (the same amount as 4 medium eggs), rapid carbohydrate utilization, essential amino acids to enhance the formation of muscle and a unique taste! Max’s protein blend (Whey Protein Concentrate, Soy Protein Isolate, Whey Protein Isolate,), wheat flour, sucrose, milk compound chocolate (sucrose, vegetable oil, cocoa, emulsifier,(322), flavour,), margarine (vegetable oil, water, salt, emulsifiers (322, 435, 471, 475, 476) natural colour (160a), flavour), whole egg, glycerine, polydextrose, cocoa, milk solids non fat, brown sugar, flavours, maize starch, raising agent (500), tapioca starch, salt, Glutamine peptides, L-Leucine, L-Isoleucine, L-Valine, Preservatives (202, 282). *Contains Dairy, Soy and Wheat. May contain traces of peanuts & other nuts.